Test Method RS101 of MIL-STD-461D/E/F requires radiated magnetic fields over the frequency range 30 Hz to 100 kHz (to 200 kHz for ISO 11452-8) to determine the susceptibility or immunity of the equipment under test (EUT). 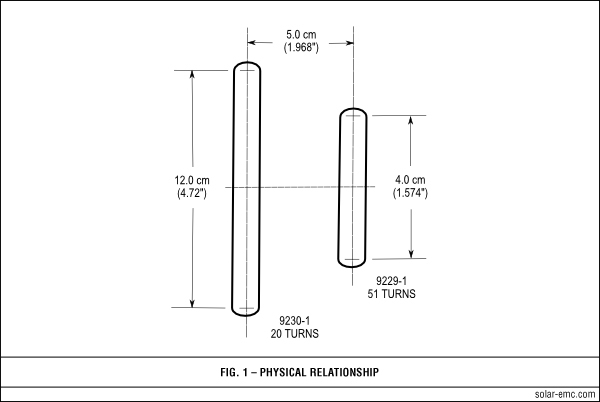 Two loop antennas are needed for compliance with the requirements. 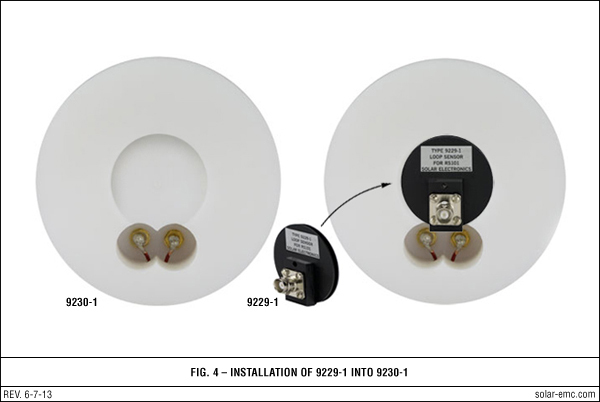 The radiating loop is 12 cm in diameter and the sensing loop (used for calibration) is 4 cm in diameter. 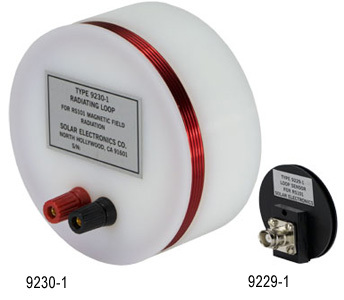 The Solar Type 9230-1 Radiating Loop has been designed so that the Solar Type 9229-1 Loop Sensor can be attached at the required 5 cm distance to the back of the loop (see Figure 4). The arrangement is indicated in Fig. 1 (see Figures tab). With a known current flowing in the radiating loop, the magnetic field can be measured. Two graphs are supplied with the loops to make life easier for the test engineer. Fig. 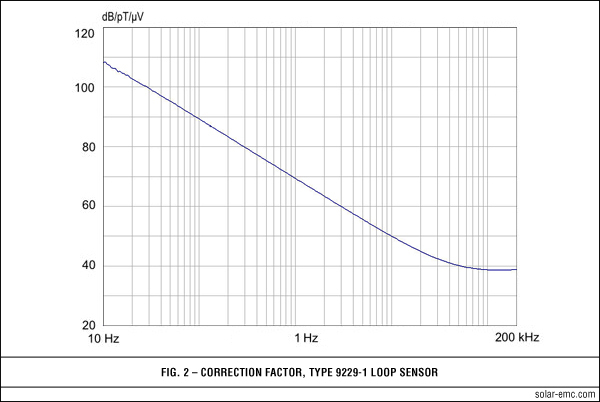 2 shows a typical correction factor curve for the Type 9229-1 Loop Sensor. The current level to produce 110 dB/pT at 1.0 kHz is 3.0 mA. An accurately calibrated EMI receiver or spectrum analyzer will measure this as 42 dB/μV. Adding the correction factor of 68 dB/pT/μV from MIL-STD-462D, Fig. 2 equals 110 dB/pT as required by the specification. In those instances where the spectrum analyzer does not have sufficient sensitivity, the calibration can be accomplished just as well at a higher current level. For example, using 300 mA, the measurement would be 82 dB. Subtracting 40 dB from this answer and adding the 68 dB factor will equal 110 dB/pT/μV. Another approach to the calibration and the measurement depends on the accuracy of the EMI receiver. Simply subtract the sensor correction factor in dB/pT/μV (Fig. 2) from the desired magnetic field level in dB/pT. Then adjust the current until the EMI receiver reads this value in dB above one μV. Example: For a field of 110 dB/pT at 1.0 kHz, subtract 68 dB (Fig. 2) from this to obtain 42 dB. This value in dB above 1 μV on the EMI receiver is equal to 126 μV as indicated in RS101. A typical calibration test setup is shown in Fig. 3a. 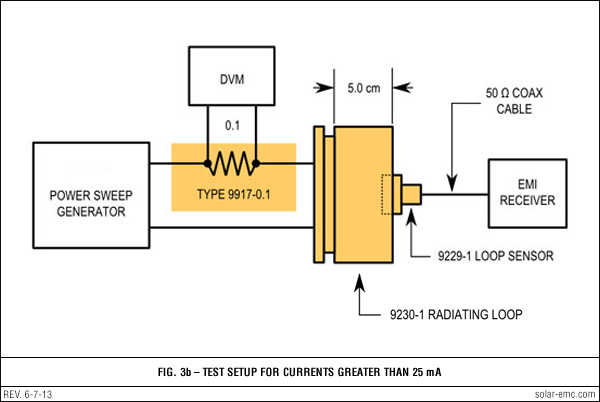 For current levels below 25 mA, it is feasible to use a standard laboratory signal generator. For higher current levels, the signal must be amplified (Fig. 3b). 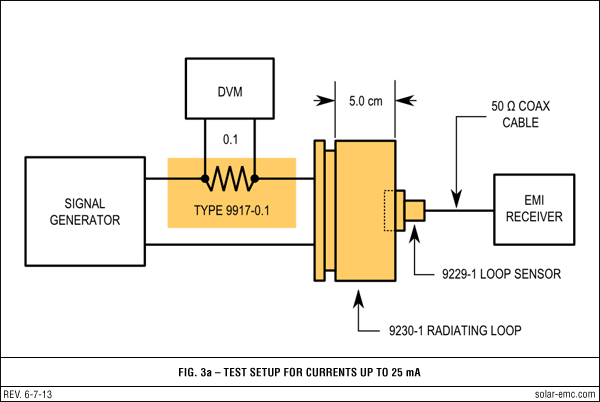 Both methods show a 0.1 Ω precision resistor (Solar Type 9917-0.1) and a digital voltmeter for measuring the current.